Oh dear. I very much admired Rian Johnson's neo-noir debut, BRICK, and loved the style if not the substance of BROTHERS BLOOM. But his third feature, LOOPER, is to my mind the most over-rated film of 2012. Now, I realise that it is not Johnson's fault that the marketing department called his film the MATRIX of our times. No film was likely to live up to that billing. But LOOPER is so intellectually and emotionally disappointing that the blame must lie with Johnson as much as with the PR department. The central conceit has promise. In 2044, the USA is a decrepit ex-superpower, its people impoverished, its currency debased, beholden to China. Joseph Gordon Levitt plays Joe, a contract killer who dispatches men sent back by the mafia from 2074, where time travel has been invented but also outlawed. This exposition is deftly handled and the key emotional problem set up: Joe has to kill his future self to fulfil his contract, but his future self is desperate to live. Both trapped in 2044, Future Joe tries to assassinate the child who will become the mafia kingpin in 2074 - the child that the yoiung Joe has become emotionally attached to. There are three problems with this film. The first is that the events of the film violate the rules of time travel as set up by Rian Johnson. (There's a brilliant article explaining why in the Huffpost.) Admittedly, Johnson admits this failing, giving 2044 mob boss Abe a throwaway line telling Joe, and us, not to worry about it lest our "brains get fried". This is all well and good in a movie that is emotionally gripping - the audience will willingly suspend disbelief when their heart is engaged. But in LOOPER that just isn't the case. That's because, just as the movie has set up its intriguing premise, it suddenly takes a left turn from sci-fi into paedophobic horror, with the little kid who will become the 2074 mob boss behaving like something from THE OMEN. He has telekinetic powers you see - a random conceit that was mentioned in the first five minutes of the film and then completely forgotten about until Johnson had written himself into a hole. 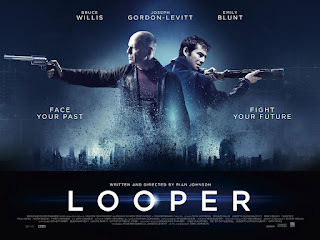 In other words, LOOPER isn't a sophisticated well thought out sci-fi thriller along the lines of THE MATRIX, or TWELVE MONKEYS, but two halves of two films, both of which show promise, but neither of which is particularly well developed. But the absolute killer - the thing that absolutely ruined the movie - that made it jump the shark, was the casting, acting, and editing that made the little kid with TK powers an object of absurd comedy. It's hinted at that he killed his mum in a TK rage, he is preternaturally smart and emotionally sophisticated and utters his lines with such an implausibly earnest air that everyone was laughing at him in the screening I attended. The movie had just lost all credibility. And with no emotional stakes, the supposedly big emotional ending had no force whatsoever. The upshot is that LOOPER is not a movie that lives up to sci-fi greats like THE MATRIX or time travel greats like TWELVE MONKEYS. It doesn't even live up to SOURCE CODE or MOON. 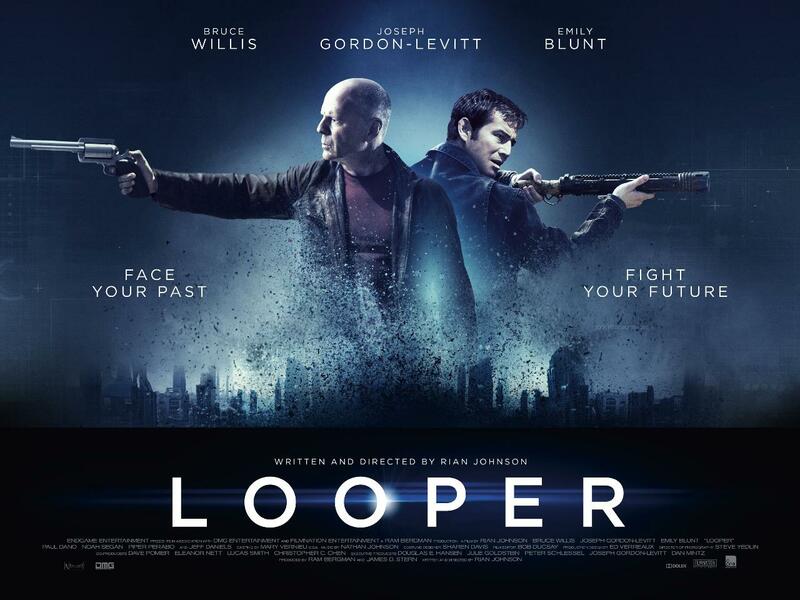 LOOPER played Toronto 2012 and is currently on release in Australia, Croatia, Greece, Hong Kong, Hungary, Israel, New Zealand, Russia, Brazil, Canada, Estonia, Iceland, Ireland, Lithuania, Sweden, Germany, Denmark, Bulgaria, Mexico, the UK and USA. LOOPER opens on October 12th on Argentina, the Czech Republic, Portugal, Singapore, India, Norway, and Turkey. It opens on October 19th in Chile, Slovenia and Spain. It opens on October 31st in Belgium, France, Finland and Poland; on November 29th in the Netherlands and Taiwan; in Taiwan on November 30th; in South Africa on December 14th; in Japan on January 12th and in Italy on January 31st.